Every month of the season provides an opportunity to tend the garden (except the months when it's blanketed in snow). And August, being one of the hottest months in North America, is no exception. While some gardeners long for fall around this time, others are relishing in the bounty both a vegetable and flower garden provides. Keeping up with maintenance during the hottest month will assure both the health of your garden in spring and a shorter maintenance list for fall. No doubt. Weeds are most prolific in August. As summer sets in weed seeds become well established, and their plants flourish in conditions less suited for vegetables and flowers. Staying on top of your weeding—this month especially—will deter new weeds from seeding themselves, allowing fewer of them to propagate next year. Keep on track, and in a few years, the dreaded task of weeding will become smaller. Stay on top of the deadheading too, to keep perennial gardens and annual pots looking their best. Pickoff old, spent flowers to allow for healthy new growth and buds to form. Keeping up on this task forces ever-bearing plants to keep producing flowers. And if you have a perennial that is just plain unruly, pinching it's flower heads prevent it from seeding and out-competing the other plants in your garden. Harvest time is certainly the most awarding season for vegetable growers. While your lettuces and radishes may be passed, tomatoes and squashes are just getting going. Harvest ripened vegetables like cucumbers, broccoli, carrots, and cabbages, too. As you pick your aboveground plants, more vegetable flowers will form to be pollinated. And thinning your root vegetables allows those beside it to grow bigger, while also allowing you to get a jump on your food storage practices. August can turn any landscape (edible or not) into a mess of falling, brown plants trying for one last round of blossoms. Removing their dying portions creates less garden cleanup work later in fall. And who knows? If cool temps set in early, the healthy green plants may yield one more round of flowers. If your clearing efforts go overboard and whole plants need to be removed, make sure to fill in empty spaces. Use mulch, layer gardening techniques, cover crops, or even fall plantings. Just don’t leave the ground bare to invite weeds and pests. If you live in a zone suitable to fall gardening, now’s the time to get things started. As days get cooler, kale, lettuce, arugula, mustard greens, and spinach will proliferate and complete their harvest before the snow hits. Sow seeds directly into the ground, cover them and keep them soaked to encourage sprouting. 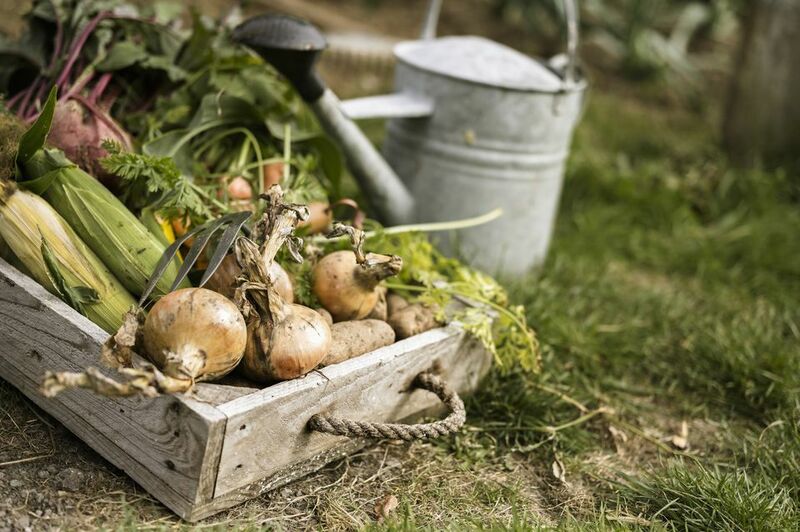 If you live in a hardier zone that stays warmer longer, beets, radishes, broccoli, and cabbage can be sown from seed, as well. But even if you can’t get more vegetables in the ground, strongly consider planting a cover crop to keep the soil loose, prevent weed build-up, and restore depleted nutrients to the ground. If you haven’t created one already, a DIY compost pile is a simple weekend effort that will yield excellent returns. Add organic materials like rotted vegetables, plant scraps, and leaves to create a mulch pile that can be used as compost at a later date. By the time the last of the harvest is gone from your garden, your compost and mulch will be ready to spread, enhancing the growing spaces for next year. If you have shrubs, trees, or other perennials, it's TLC time! Don’t deadhead or fertilize anything that won’t make it through the cold months ahead, as now is not the time to encourage new growth. Instead, prune them back, as needed, once the blooms are over. For shrubs and trees that are still going strong, provide deep drinks of water, especially in hot climates. August's sun will evaporate any light watering efforts, leaving little benefit to the plant.